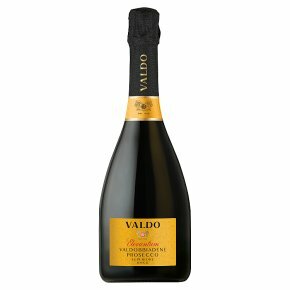 From the heartland of the Prosecco region, where yields are low and quality high, this has aromas of golden apples, acacia and honey with a delicate off-dry palate, fresh citrus flavours and fine bubbles. This softly fruity, floral fizz has real poise and elegance and is perfect for parties. Wine of Italy. Oro Puro Prosecco is of superior quality, as it comes from a specially defined inner hilly region in the DOCG area of Valdobbiadene, North-East of Venice. Less fruit per vine gives more intensity and complexity whilst retaining all the delicious aromatic and fruity charm one expects from this world-famous sparkling wine. Ideal as an aperitif, especially with prosciutto ham on breadsticks, a great match for light pasta, vegetarian, fish and shellfish dishes and a perfect sparkling wine for any occasion.